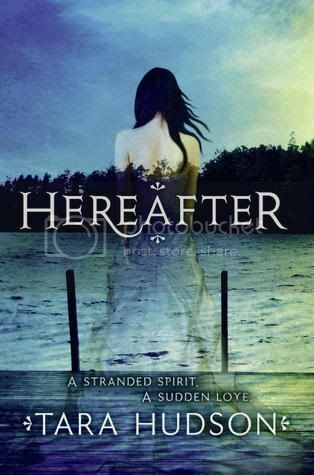 Hereafter is the first book in the ‘Hereafter' series by debut author Tara Hudson. I really enjoyed reading this book. I’ve not read many ghost stories, but I really liked this one. I read the book in just a few hours time, and I was completely lost in the story. Hereafter has it all; paranormal, action, and just the right amount of romance. I really liked the two main characters, Amelia and Joshua. Amelia is a ghost, and doesn’t remember anything about her former life. She’s lost and lonely in her little world, and she doesn’t know why she’s lingering on earth. When she meets Josh, her whole world turns for the better. Joshua is such a sweetheart. I love the relationship that grew between them, so sweet and sometimes intense. The story is well written and fast paced. It really held my interest throughout the book. The story has stayed with me long after I finished reading it. It especially had me thinking of ghosts for a while after. I have to say I love the book cover as well. It’s gorgeous! Overall, I really enjoyed this book. It is definitely a great start to the series, and I’m really looking forward to reading the next book. I love the cover as well. It's one of the first things that drew me to this book. Great review! This one looks really good and the cover is gorgeous. Great review! I also liked the romance between Amelia and Joshua! It was pretty cute! Ghost stories are my favorite, I wish there were more of them! huh.. I think it is interesting how I keep reading a mix of reviews for this book. I'm not usually one for ghost stories, but I do like stories that stay with you long after you finish reading them. Great review. I am excited to pick this one up. I thought the trailer was good too, and I hadn't seen it yet! I had heard mixed things but you made it sound worth my time so I will give it a try. I posted my review of this one today, too! What an engrossing read, huh? Glad you liked it as well. I can't wait for the sequel. Hm I want to read this one to see what I personally would think of it. I've been hearing either super awesome things about it or just bad things! I have been excited to read this book since I first saw it but after seeing that trailor I'm even more excited! Great review, I'm glad to hear that you enjoyed it!